It’s that time of year for resolutions and new goals. With chilly temperatures I always find myself registering for races to help motivate me to keep me moving throughout the winter. The B3 Distance Series is perfect for this and provides fun races on your calendar to look forward to throughout the New Year. One of my favorite parts about this challenge is that it offers motivation to train for races all year long. By signing up for the B3 challenge, you are registering for races in March, April, and September. It’s the perfect way to stay motivated to train through the winter, spring, and summer. Along with motivation for months, the B3 Distance Series is great because the distance of each races increases with each event. If you have been eyeing running a longer races such as a fall half marathon such as the Baltimore Running Festival, this is the perfect challenge to help you increase your distance. You’ll start with a 5K, move onto a 10K, and finish with a 12 mile race. If you need some extra support in training, you can join a Charm City Run training group for any or all of these races too! Some of my favorite race premiums are the B3 Distance Series races ones which are all Under Armour products. There is always a great technical shirt or premium such as a pullover or jacket for each race, always with a gender-specific option. By registering for the challenge, you also receive an extra B3 premium upon completion of all three events which is usually a great piece. I loved the pullover we received last year. This year according to the website it looks like it will be a pullover (men) or half zip (women) as well. Also each runner who completes the challenge receives a special B3 medal at the end of the Charles St 12, as a bonus in addition to the individual race medals. If that wasn’t cool enough, for the first time finishers will receive a medal at the end of the Shamrock 5K and Sole of the City 10K. If you are all about the bling, this challenge is for you! I love how unique and fun these three races are. The Shamrock 5K takes place just before the Baltimore St. Patrick’s Day parade and is a fast, fun race with a great post-race party at Power Plant Live! It’s one of the largest races in the city, and nothing beats watching a giant sea of green-clad runners coming down Charles Street. The Sole of the City 10K offers a fun 10K course that takes runners around the Inner Harbor, ending with a post-race party at McHenry Row in Locust Point. The Charles St 12 is one of my favorite Baltimore races with 12 fabulous miles down historic Charles Street starting in Towson and ended at the world Under Armour headquarters in Locust Point last year. Each race offers a unique course, post-race party, and experience. Convinced yet? Join me in running the 2018 B3 Distance Series by clicking below! Lauren is an adopted Charm City resident who is a future occupational therapist by day and part-time health and fitness nut the rest of the time. 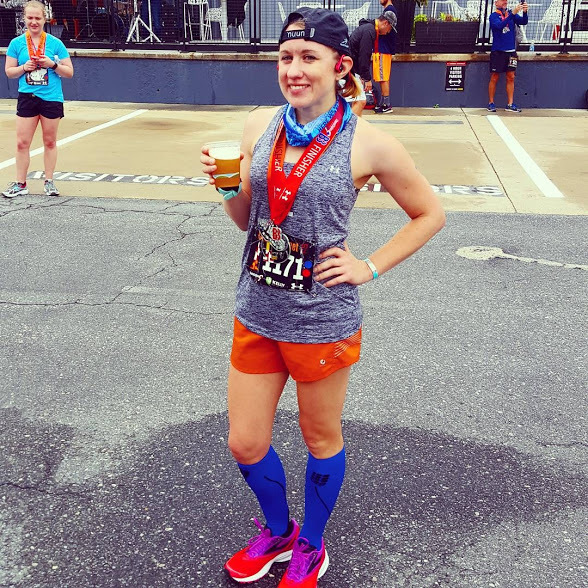 Besides being a runner & Charm City Run coach, she is a foodie, science nerd, sweet tooth, panda lover, hippie at heart, and beer & whiskey enthusiast. She got hooked on running after her first 5K in 2012 and has since become a marathoner and completed countless other races. Besides running she loves participating in yoga, spin classes, and November Project Baltimore. Lauren is the creator of Breathe Deeply and Smile where she writes about the finding happiness, running, health & fitness, food, and Baltimore happenings. Lauren believes in running happy, dreaming big, enjoying life, and never passing up dessert!